Everything we know about Anne comes from stories handed down through the ages. Nothing is certain, but Tradition tells us that Mary's parents were Anne and Joachim (pronounced Wa-keem). They never gave up praying for a baby. Anne prayed unceasingly while her husband went out into the desert and fasted. They had unshakable faith that God would bless them, and bless them He did! Not only did they conceive a child, but a child who all generations would call blessed, the mother of our Savior, Jesus Christ. We don't know if Anne was still alive when her young, unwed teenage daughter became pregnant. If so, what was her reaction? Did she get to cradle the Christ Child in her arms? Did she spoil Him as a grandma? We don't know, but we can only guess that she must have been a marvelous mother to be chosen to raise the Blessed Mother, God's own mother and ours! The holy woman who conceived, bore, and raised Jesus Christ and then has continued to watch over, guide, pray for, and mother all of mankind for over two millenniums would have taken her example from Saint Anne. Anne's unfailing faith and perseverance in prayer, along with that of her husband Joachim, earned them an important role in salvation history. We can guess that the love in the heart of this good woman who knew with certainty, that all things are possible for God, must have been pure and amazing. The ripple effect from this amazing love reverberates throughout human history even today, through her most holy daughter – still loving over two thousand years later. How worthy to choose such a loving and faithful heart to imitate. Saint Anne was born in Bethlehem and married Joachim from Nazareth in Galilee. Joachim was a shepherd given the task of supplying the temple of Jerusalem with sheep for sacrifices. After twenty years of marriage Anne and Joachim had no children. Once, when Joachim overheard ridicule because of their childless state, he is said to have gone into the desert to plead with God to give them a child. After a time of fasting an angel appeared to assure Joachim he and Anne would be given a child they were to name Mary and dedicate to God. In the meantime, Saint Anne wondered where her husband had gone and in her despair at having been barren she prayed while she watched newborn birds in their nests in her garden. She cried out, “Why was I born, Lord?” That is when angel appeared to tell her she would soon give birth to a daughter she was to name Mary. The story continues with Anne and Joachim’s joyous reunion at the golden gate of Jerusalem. After her birth Anne and Joachim dedicated Mary to God at the temple of Jerusalem and she spent much of her childhood there. When Mary was fourteen they betrothed her to Joseph of Nazareth and so Mary’s story continues with the birth of her son, Jesus, and his life on earth. 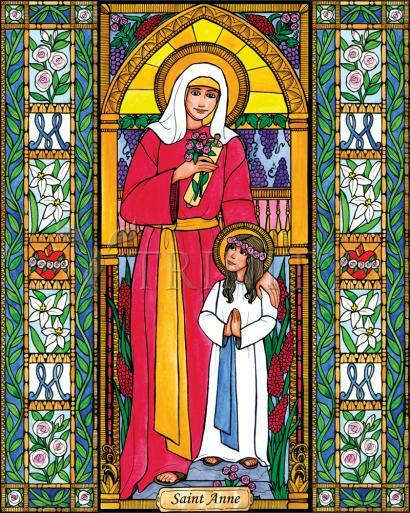 The life of Saint Anne and her connection as holy mother of Mary and grandmother of Jesus was very popular to early Christians. In the year 550 a church was built in honor of St. Anne in Jerusalem. It is believed to be near where Anne, Joachim and Mary lived. Since the Seventh Century the Greek and Russian Churches have celebrated feasts honoring St. Joachim and St. Ann. The Western Churches began to celebrate the feast of St. Anne in the Sixteenth Century. The feast of St. Anne is July 26th. There is no mention of Anne in the New Testament. The story of St. Anne comes chiefly from the Protoevangelium of James which only dated back to the second century. St. Anne, patron saint of mothers and women in labor and minors, is symbolized by Mary in her lap holding the infant Jesus.